Life has begun to feel like I am sort of auditioning for one long YouTube video. I’ll be alone, say, in an empty windowless corridor or in the bathroom. But when I speak and move, I edit myself as though I am being watched, More specifically, I am picturing myself as if I am on film. Even down to my thoughts – often, I’ll be talking to myself in my head and if mid-thought I stumble over my virtual words, or think the wrong word, my brain will go back and re-run the thought as if I were saying it aloud. To an audience. Why can’t I be myself with myself any more? I’m not quite sure how I let this happen. I’m not exactly a performer, there is certainly no unrealised desire in me to be famous, to be seen. I prefer to be alone. You could argue, quite rightly, that writing a blog is a performance. But clearly the appeal for this writer is that I can always edit. I’m sure I can’t be the only one who has noticed themselves doing similar. Ringing any bells? Although I’ve been thinking about this only recently, I know it’s something I have been doing for a long while. And I blame the television! A pretty easy target. But, worryingly – or rather, not worryingly at all in this day and age – my TV is always on. It literally is a member of the family, a friend. Well, come on, friends – we have several. And so with 30 years of such indoctrination is it any wonder that we are constantly putting on a show. We’ve been practising all our lives – almost trained to act like we’re being watched. Like it or not, it’s not just the actors behind the screen – somehow, we have all become performers. It must be even more intense for the younger lot or perhaps – not that they will have noticed. It will have been this way for their whole lives. For this generation TV isn’t so much influential as dictatorial. A guide for a life in front of the screen. Even on the most basic level, there’s always the threat of someone taking your photo. Then there are the bigger, inescapable eyes of Big Brother, watching our almost every move. And now, with social media, we are always being watched. It’s exhausting! And not just the show, remembering to check your words and your outfits. No, there is the vast mental effort needed to consider, and the impact this performance has on our self-esteem. Our ideas about life in general. With so much visual competition there’s a lot to learn from, to inspire and challenge us to improve and grow, yes. But we have all set up an outer image of ourselves – the persona we want the outside world to recognise us as, the persona we want to convince ourselves that we are, even in private – and how can we constantly live up to that? It’s as though we are measuring up to a hologram. I recognise this because I know it is something I do in myself. 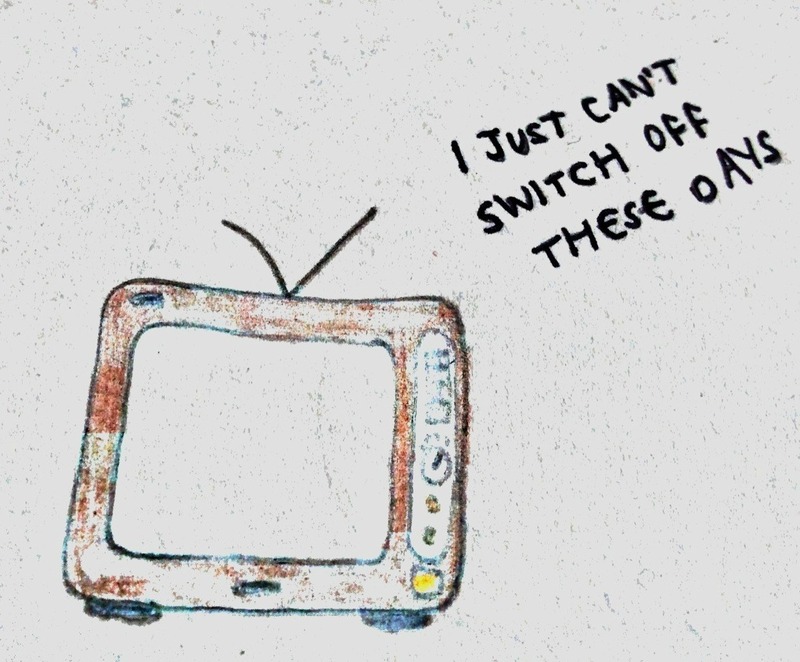 As a teenager I had created a persona that I never let myself switch off from, even once the bedroom door was closed and it was just me (and the TV), because I wanted it to be real. Laughably, that aspirational figure was very much based on Bridget Jones. Somehow, the constant pretence made it more believable. It was comforting to pretend. Remember those poignant words of William W. Purkey? You gotta dance like there’s nobody watching. I’m wondering, are we actually capable of this anonymity anymore? Or has the mantra turned on its head? You’ve got to dance like somebody is watching, because there most likely is – even if it’s just in your head. I came across an article recently about what was referred to as the great illusion of the self. Of what little of it I understood, there seems to be a growing argument among psychologists that we – or rather ‘you’ – are not the person you thought you were, underneath it all. And with this in mind, maybe there isn’t any real harm in pretending. Besides, what greater comfort is there?